[157 Pages Report] The global light tower sales market is estimated to be USD 2.02 Billion in 2017, and is expected to grow at a CAGR of 6.1% from 2017 to 2022. This growth is mainly attributed to a rapid growth of the construction industry, especially in developing nations of the Asia-Pacific region, growing investment in the oil & gas sector, and restart of investment in the mining industry. 2016 has been considered as the base year for company profiles. Whenever information was unavailable for the base year, the prior year has been considered. This research study involved the use of extensive secondary sources, directories, and databases such as Hoovers, Bloomberg Businessweek, Factiva, and OneSource to identify and collect information useful for a technical, market-oriented, and commercial study of the global light tower market. Primary sources are mainly industry experts from core and related industries, preferred suppliers, manufacturers, distributors, service providers, technology developers, standard & certification organizations of companies, and organizations related to all the segments of this industry’s value chain. The points given below explain the research methodology. 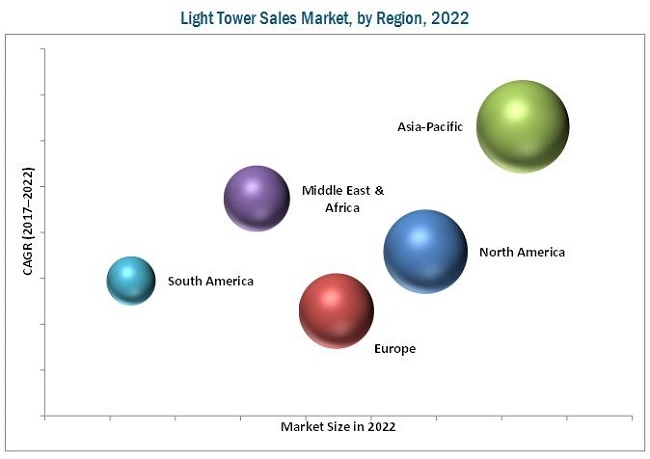 The global light tower sales market is projected to grow at a CAGR of 6.1% from 2017 to 2022, to reach a market size of USD 2.72 Billion by 2022. This growth is mainly attributed to a rapid growth in the construction industry, especially in developing nations of the Asia-Pacific region, growing investment in the oil & gas sector, and restart of investment in the mining industry. The report segments the light tower market on the basis of fuel type in to diesel-powered light tower, solar-powered light tower, and direct-powered light tower. The diesel-powered light towers are widely used in construction, mining, and oil & gas industry due to high reliability of diesel generator sets, easy availability of fuel, ease of storage of fuel, longer running time, and simple maintenance. 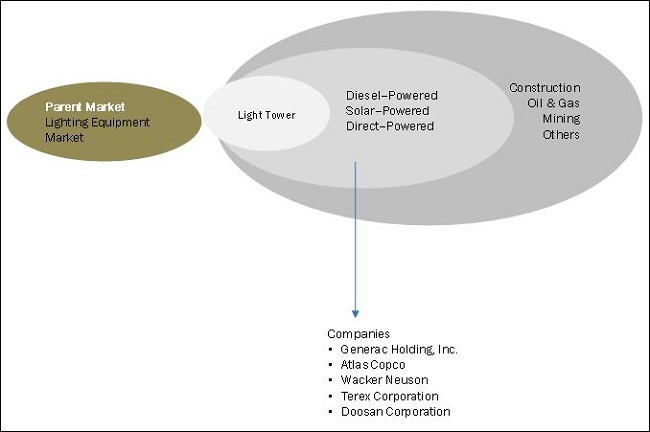 Due to these reasons, the diesel-powered light tower segment is projected to dominate the light tower market during the forecast period. However, due to growing pressure on the environment, the solar powered light tower market is expected to grow at a higher pace during the forecast period. The light tower sales market is segmented, based on end-user into construction, mining, oil & gas, and others, which includes agriculture, airports, emergency services, military, rentals, social & sports events, and motion pictures. Construction end-user is expected to grow at the highest rate in the end-user segment. A rapid growth in the construction sector, especially in the Asia-Pacific region is expected to drive the light tower market. Countries such as China and India are investing heavily in developing transport infrastructure to support growth of their economies, and is expected to drive the construction end-user segment during the forecast period. The light tower market is segmented on the basis of light type LED light tower and metal halide light tower. The LED light towers are expected to grow with a relatively high CAGR from 2017 to 2022. The key driving factor for this segment is increasing implementation of solar panels to reduce carbon footprint, government regulations & subsidies for solar panels, and LED lighting. Eco environment friendly policies are expected to drive the LED light tower market from 2017 to 2022. Asia-Pacific is the largest market by size and is estimated to grow at the highest rate due to rapid growth in the construction industry, especially in China. High investments in the construction sector in China has created a demand for portable light towers. Asia-Pasic is home to many developing nations such as India, Indonesia, Taiwan, and Malaysia. All these nations are focusing on developing their infrastructure which in turn is expected to drive the demand for light tower in the Asia-Pacific region. The major factors restraining the growth of light towers are large unorganized market. Most of the market share is held by the unorganized sector, i.e. the local or regional players. International players have to follow globally accepted regulations for light towers such as emission regulation for diesel generators used in light towers, ATEx & AEx certification for light towers to be used in hazardous areas, and anti-glare lights for highways or road construction. These certification and testing adds-on the cost of light towers. However, local players have to only adhere to regional standards and have an advantage of local production, thereby, bringing the cost down. This makes slightly difficult for international players to compete with regional players, restraining their light towers growth in the regional market. The market is dominated by few international players which holds major share of the light tower market. Major suppliers for light towers include Generac Holding, Inc. (U.S.), Atlas Copco (Sweden), Doosan Corporation (South Korea), Terex Corporation (U.S.), and Wacker Neuson (Germany). These players are expanding their market share by winning new contracts and researching and launching new products/services/technologies in the market. 12.10 P & I Generators, Ltd.
12.14 Quzhou Valiant Machinery Co., Ltd.
12.18 Ishikawa Machine Co., Ltd.
12.22 Perennial Technologies Pvt., Ltd.